Swine. That's a refined name for pigs, right? 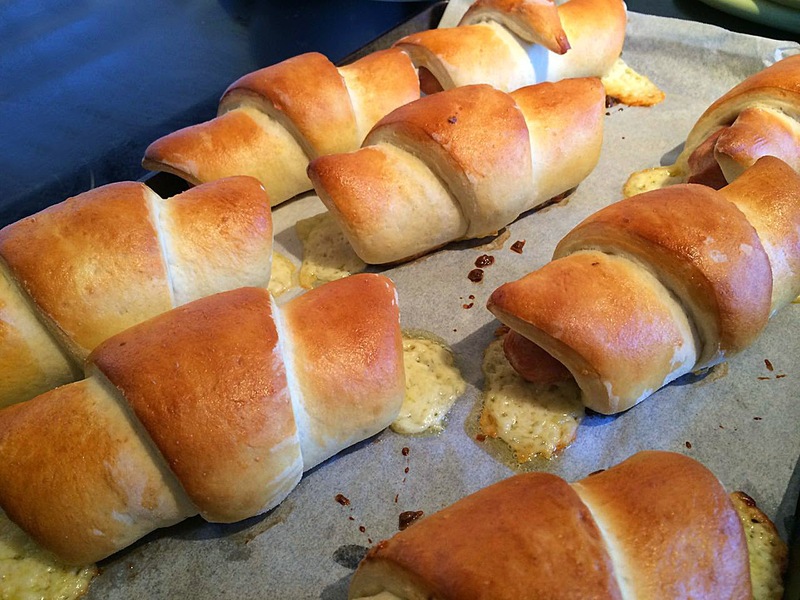 So these are Swine in a Blanket. I need to get to the grocery store more often. It seems living alone through the winter/spring (my spouse is at college) has left me a little “uninspired” as far as the kitchen goes. My grocery purchasing habits have not been whet they were for the last several years. I admit it – I’ve been eating junk. But does junk always have to be bad? Short answer, no. I have several recipes on this site posted a few years ago where I have re-interpreted junky recipes into more palatable versions. Search “junky” on this site. So what did my vast (ha!) pantry yield tonight? An opened package of hot dogs. Inspiring, eh? Well just wait a minute. It can be. It’s said the devil is in the details. It can also be said that the angels are in the creativity. Not one to be out-classed by something I had to deal with from the fridge, I took it upon myself to upscale pigs in a blanket. How does homemade dough, gooey mozzarella, rich caramelized onions with jalapeño, and crumbled bacon sound? Not one single Pilsbury dough boy was harmed in this process. As you can imagine, making your own dough is a little...involved, and does extend your prep time. But it’s not that bad. And think of the oohs and ahhs you’ll receive when they come to the table. They smell and look fantastic, and they’re probably almost good for you. Almost. Up that quotient by serving a nice, crisp green salad on the side if you feel so inclined. Me? I had potato chips. Heat the water in a microwave in a ceramic bowl to 110°F. Add the yeast and sugar and let proof until creamy, about 10 minutes. Then add the salt and flour. Bring together in the bowl and then knead for 2 minutes on the counter. Place the dough back in the bowl, cover with plastic wrap and a towel and let rise for 45 minutes. While the dough is rising, make the onions. Melt the butter in a skillet and add the sliced onions, jalapeño and sugar. Cook over medium heat, stirring often, until the onions soften and begin to turn brown. Set aside. 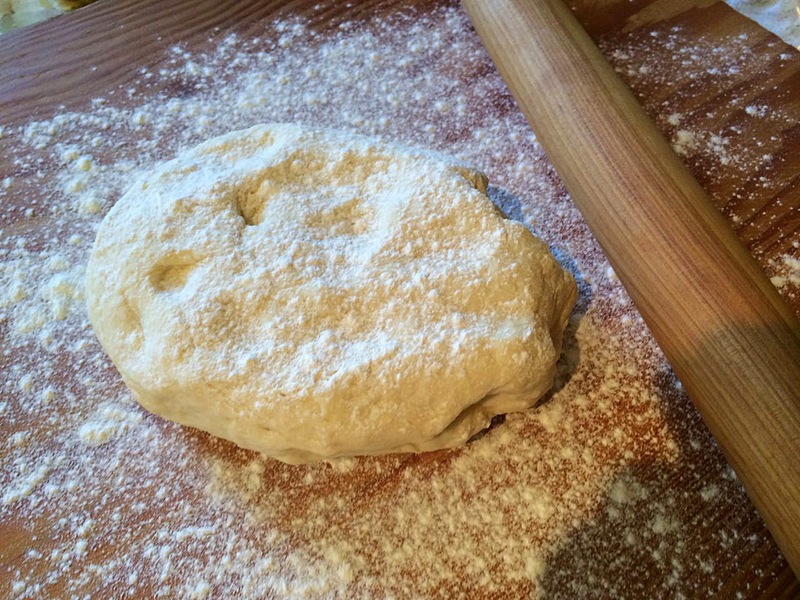 Once the dough has risen, lightly flour a rolling board (or the counter) and put the dough on it. Roll out to a rectangle (roughly) 18” x 10”. Cut into four rectangles. Then cut each rectangle in half to make 8 triangles. 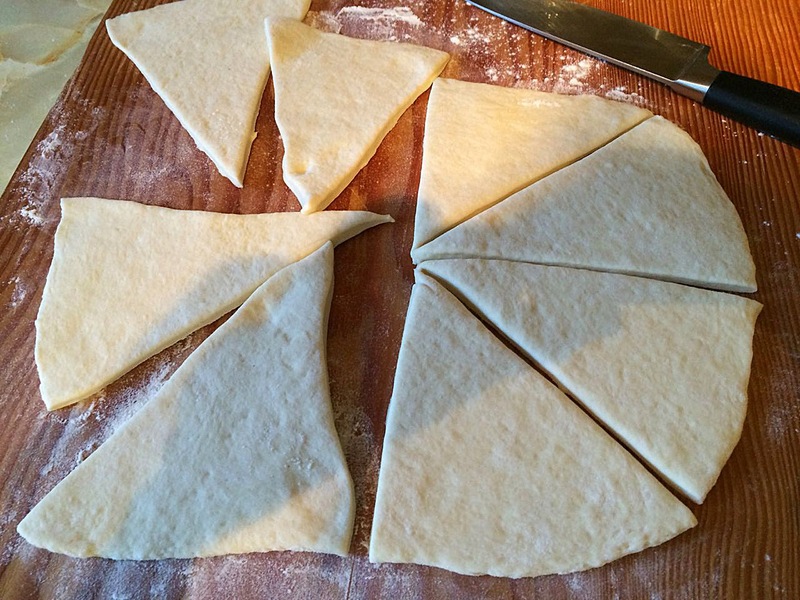 Gently pull each piece of dough by the corners to make the rectangle shape more pronounced. 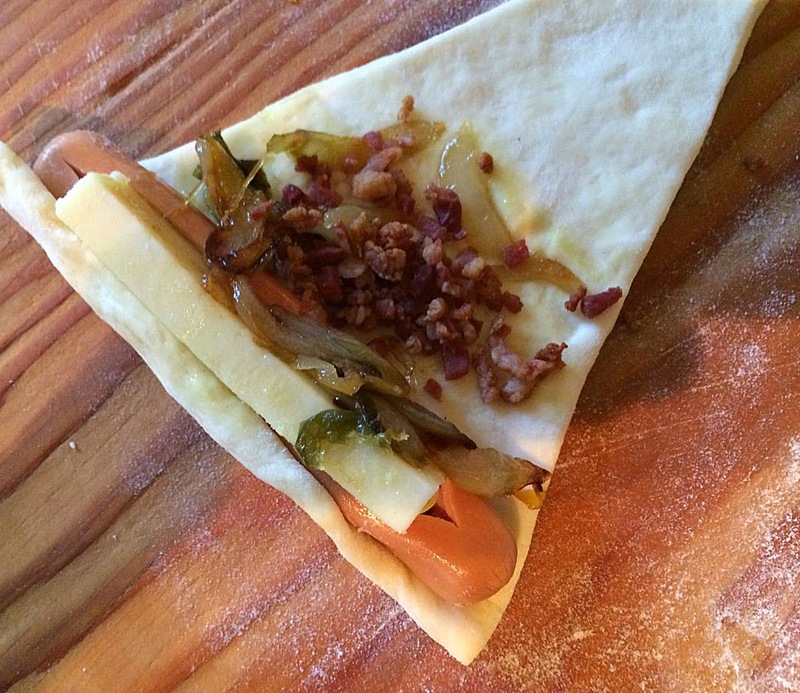 Place a cheese-stuffed hot dog on the edge of each triangle of dough. Divide the onions between the triangles. Add about 2 tsp of crumbled bacon bits to each. Roll up and place on a parchment lined (or well greased) baking sheet. 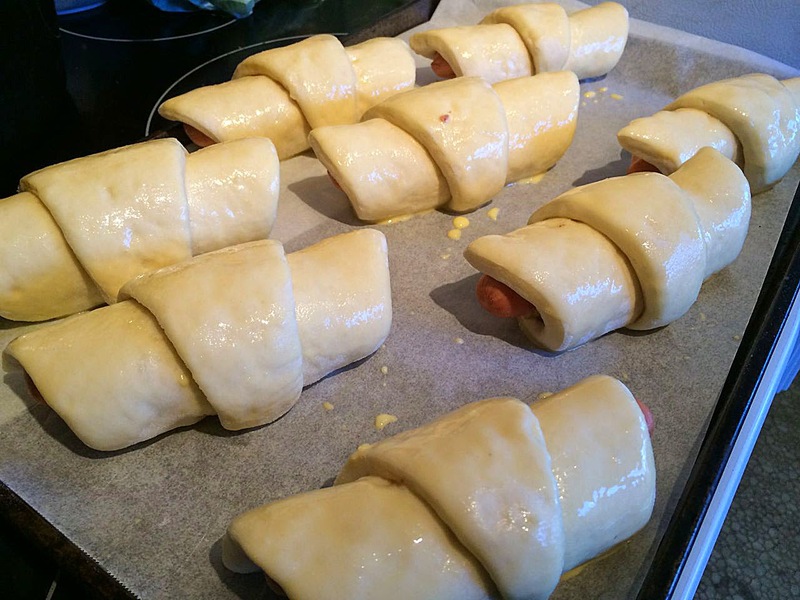 Make sure the point of the rolled up dough is on the bottom. Let the “pigs” rise for 30 minutes. Preheat the oven to 400°F. Mix the egg and milk together in a small bowl. Just before baking, brush the dough with the egg wash. Bake for 25 minutes. Let cool slightly before serving. we are about to eat healthy junk today too. 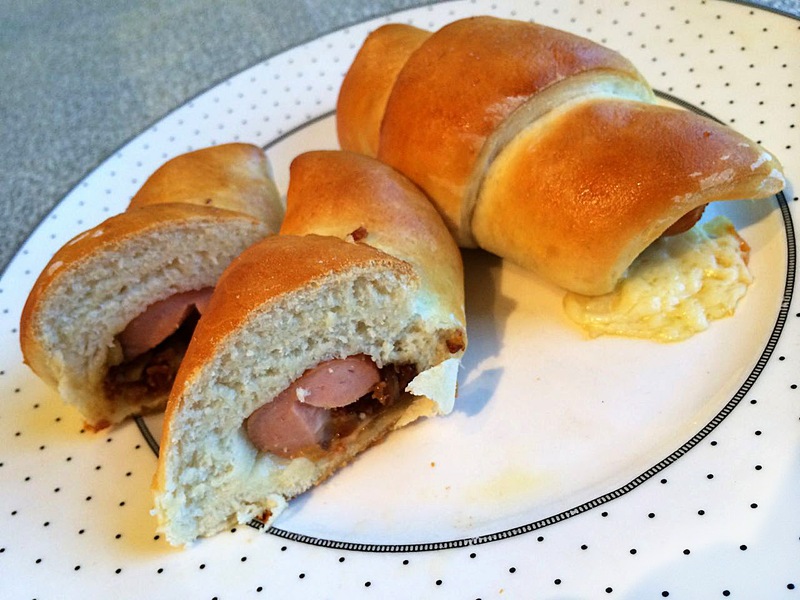 i am making your hot dog buns and your relish is chillin' in my fridge so it will be a hot dog day here! i am still cranking out your recipes and they are wonderful!!! hahaha...check out my post today!